No inspiration from real life (thank goodness!)... except maybe Addy’s cell phone rant. That’s all me. But as far as the rest, I’ve always been a fan of horror/comedy. I’d definitely have to say Evil Dead II and Shaun of the Dead have been inspiring targets as they both manage to be campy, fun comedies, providing plenty of belly laughs, while still standing as horror films that provide a few good scares as well. There’s also a little Woody Allen, though, in the sense that the characters are all either a little off-center, neurotic or wry. Well, I suppose there may be a little of all of them in me, some more than others. But I most associate with the hosts: I have Addy’s obsessive need for order and control, tempered with Caleb’s “Don’t worry” and “Can’t we all just get along” attitudes. That probably makes me sound a little schizophrenic, but I’d be the first to admit that! The film reflects all my various tastes in humor, from sly sarcasm to broad slapstick. 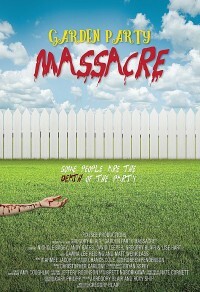 I love understated, witty banter à la Downtown Abbey as much as over-the-top sight gags the Farrelly brothers excel at, so I threw everything into Garden Party Massacre wherever inspiration struck. Hopefully, the result will mean there’s something for everyone. As far as horror goes, I think it’s pretty standard in the sense that you have (for the most part) a group of people terrorized by a psycho killer with appropriate scares and whatnot. But I’m also playing with the inherent silliness of that trope as well—both the scenario and the kinds of stock characters and their reactions and behaviors. Then, I go and poke fun at a few other horror staples I’d rather leave as surprises for now. My psychological thriller Deadly Revisions is very moody with dark colors, shadowy lighting and creeping camera work. Since Garden Party Massacre is more of a spoof, with the comedy element above the horror element, we’re aiming for a light, bright atmosphere; almost echoing the style of a sitcom. As things get crazier, story wise, the camerawork will get more frenetic and crazier as well. I’m a big believer in form and content reflecting each other and, in this case, I think it will add to the fun. I’m very excited about the cast and crew we have lined up thus far. 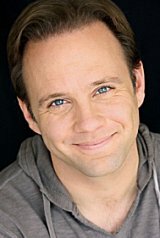 I’ve got Andy Gates (Grimm, The Young and the Restless, etc.) set to play Caleb. He’s the perfect, down-to-earth, guy-next-door type. Vida Gahfarri (Jimmy Kimmel, The Mindy Project) [Vida Ghaffari interview - click here] can rock a perfect mix of glamorous and goofy... which is kooky Reena in a nutshell. And from day one, the voluptuous, baby-doll voiced Dawna Lee Heising [Dawna Lee Heising interview - click here] was my choice for Melanie, the Cougar from Hell. I’m stepping in front of the camera as well to play dopey, dumbbell Lincoln. (Hey... Who said “type casting”?!) Crew-wise, I've teamed up again with my Deadly Revisions co-producer Roxy Shih and have snagged the wickedly talented DP, Nate Cornett, the man behind the camera of the twisted black comedy series Kill The Baby. So we’re batting a thousand, as the saying goes. We actually have our base financing in place. The crowd-funding campaign is partly to help raise awareness of the film, partly to let people get a piece of the action (merchandise and other fun stuff) and partly to augment our funding in whatever way we can. After all, the more money you have for a project, the more options you have—from choices regarding equipment, talent and even food on set. Someone giving even only $5 helps feed an actor... and actors love to eat! (Trust me!) We are also continuing to pursue (and interested in) corporate sponsorships and product placement opportunities. Basically, if someone wants to help us make the movie, we welcome them and their ideas. Film is a collaborative art and business. So no one need be shy about approaching us. I have several scripts in various hands and varying stages of development. EnMar Productions is working on Heretiks, based on a horror screenplay of mine and SOS Productions is crewing up for Dead Hamptons, a crime drama I wrote. What I’ll tackle as a director next is unknown. I have so many scripts of my own... but maybe I’ll try my hand at someone else’s. Or, if I get a lot of acting opportunities, I may ride that out. I’m wide open to what the future may bring; since I like writing, acting and directing, it will be interesting to see what takes the lead in 2016.